Itzhak Perlman. Pinchas Zukerman. A rare joint recital. Two of the greatest violinists of our time—perhaps of all time—in one of the classical season's hottest tickets! Be there for the dazzling, dueling virtuosity of these two inimitable artists in Prudential Hall! Though he has already received a Grammy Lifetime Achievement Award, Itzhak Perlman remains a compelling, vital artist, performing today with greater joy than ever before. "His playing has gained in expressivity," The Los Angeles Times recently wrote. For more than four decades, Pinchas Zukerman has been a classical phenomenon—as violinist, violist, conductor and chamber musician. 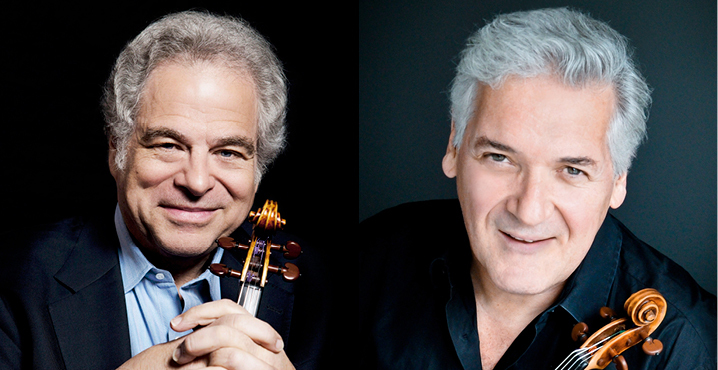 "The thing about Zukerman is that he just keeps getting better," raves The Miami Herald. "He could have rested on his laurels—yet here he [is], more passionate than ever."